***UPDATE*** On-line submission deadline has been extended to May 6! This August, there will be a brand new sewing event in Portland called Quilt! Knit! Stitch! It’s put on by the organizers of International Quilt Festival (and Quilt Market) and they’ve invited us to be a part of it. The event will be on August 14-16, 2014 and you can find a few more details about it at http://pokeysponderings.com/2013/12/10/introducing-quiltknitstitch/. Quilt! Knit! Stitch! will be presenting the Modern Metallic exhibit, a modern quilting exhibit featuring members of PNW MQGs . You are encouraged to feature the use of metallic design details including (but not limited to) fabric, thread, and themes. Robert Kaufman has generously offered participating guilds fabric from their new Quilters Metallic collection. 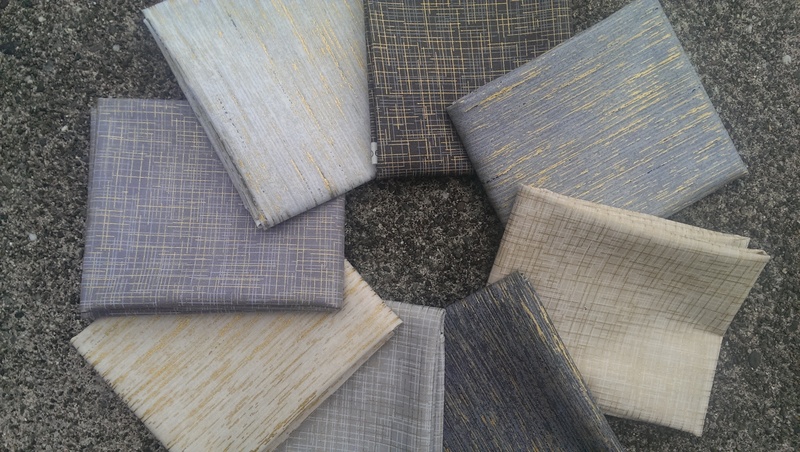 The Seattle MQG has a selection of Quilters Tussah and Quilters Linen. Our gorgeous, shimmery Robert Kaufman metallic fabric has arrived and will be handed out at the meeting next week so be sure you are there if you want to participate. Please note that including the RK fabric in your quilt is optional. Online registration will be open from April 4 – May 6, 2014. Please visit http://callforentriespnwmodernquilts.com/ for entry form and details on submitting your quilt. Accepted entries will be notified by June 6 and those will need to be sent to Houston by July 8. They will be returned to you by the end of September, unless you agree to let it travel to other shows, in which case you will get it back by July 2015. So, who’s ready to take home a bundle of sparkly goodness? Fabric bundles will be handed out at our meeting next Wednesday, March 12th, and will be first-come first-served, going by the date you renewed your membership this year. That’s right, you must be a current paid member to get fabric. Any leftover bundles will be passed out at the QWNW sew-in March 22, and left after that will be distributed at the April meeting. See you next Wednesday! Please use hashtags #pnwmodernmetallic #quilterslinen #quilterstussah #robertkaufman on your posts and photos on-line and on social media. I’m looking forward to see the fabrics at our meeting! Thank you for organizing this for our guild. How does the renewal date list work with new members? I am mentally sketching out my quilt ideas already! Hi, Ellen – The “renewal date” is better thought of as “paid by” date so it encompasses both renewing AND new members. Hope this information helps. Sketch away! I have 15 bundles left. Come to the sew-in at Quilt Works NW on 3/22 to claim one if you’d like to participate. Also, don’t forget to use #pnwmodernmetallic #quilterslinen #quilterstussah #robertkaufman when posting pictures online. Thanks!